Part of the problem, engineering experts and inspectors told USA Today, is that there are too few inspectors and a patchwork of safety regulations that are decided on a state-by-state basis. Congress relinquished control of fair safety oversight to the states back in the 1980s, so there are no concrete, uniform standards for fair and ride safety and inspections. Take, for example, Ohio, where there are 3,700 permits issued for rides annually in the state, and just eight total inspectors. While the number of permits has increased by 23 percent in the state over the last seven years, the number of inspectors has remained exactly the same. This is despite a spate of amusement ride accidents that have resulted in serious personal injury or death. Here in Florida, a maintenance worker was killed last year while conducting a routine inspection of the Hurricane ride at the Miami-Dade County Fair, just a few minutes before the park was set to open. In 2004, a South Florida fair ride caught fire after a leak in the hydraulic system, resulting in three injuries. 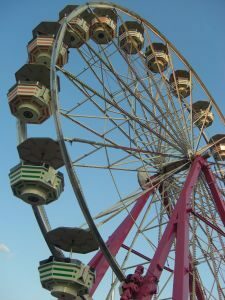 Earlier this year, a man from New York was electrocuted at the South Florida Fair after a steal beam he was holding came in contact with a power line while he was setting up a ride called the “Dutch Wheel,” a type of Ferris Wheel. In Florida, the safety standards of amusement rides are set forth in F.S. 616.242, which gives the Florida Department of Agriculture and Consumer Services the authority to inspect amusement park rides and to shut down rides that fail to adhere to certain standards and pose a risk of serious injury or death to the public. The department also is in charge of inspecting go-kart tracks, water-related amusement rides and zipline courses. Additionally, it is the agency in charge of investigating accidents involving amusement rides. Temporary – Must be inspected every time it is set up or moved. Permanent – Must be inspected at least twice a year. Owners who wish to operate an amusement ride in Florida must have a certificate of insurance for at least $1 million per occurrence and $1 million in aggregate. If you are injured on a Florida amusement park ride, you likely have several options for compensation. Our attorneys can help.